PHOTO BY JONATHON BIRD Columbian’s LJ Reaves takes a shot over the Perkins defense during the second half Saturday in Sandusky. SANDUSKY — The game went to Perkins, the moment went to Sam Siegel. Siegel snapped a tie with a 3-pointer with 3.7 seconds left, then stole the inbound pass Saturday to lift the Pirates to a 48-45 Sandusky Bay Conference Lake Division win against Columbian. Perkins (4-4, 2-2 SBC) looked to control after outscoring Columbian 16-12 in the third quarter to extend its lead to 39-32. However, L.J. Reaves caught fire in the final period for TC, netting 12 of his game-high 23 points in the final eight minutes to bring the Tornadoes (1-6, 0-3) back. But Siegel and Perkins countered with time winding down. Siegel and Joe Printy each scored 14 points for Perkins and Michael Wade added eight. Reaves was the only Columbian player to score more than five points. NEW WASHINGTON — Buckeye Central started strongly. Upper Sandusky finished that way. Buckeye Central erupted for 24 points in the first quarter, but was outscored 58-25 from there Saturday as the unbeaten Rams rolled to a 76-49 Northern 10 Athletic Conference win. Brady Biglin and Tyler Rose sparked Buckeye Central in the opening period. Both hit a pair of 3-pointers and Biglin added another bucket to help the Bucks open a 24-18 lead. But the Rams (7-0, 4-0 N10) rallied for a 35-30 lead by halftime, then raced off in the second half by a 41-19 margin. Mason Vent keyed the Rams in the third quarter. After scoring just four points in the first half, Vent netted 13 points in the period en route to a game-high 20. Cameron McCreary added 14 points, Evan Young tossed in 13 and Trevor Clifford tallied 12. McCreary also had four steals and three assists for the Rams. Biglin ended with 15 points for the Bucks (1-5, 1-3) and Rose had 12. Jake Heefner hauled in six rebounds. CAREY — Carey dominated the middle quarters and shined behind the 3-point line Saturday en route to doubling up Northern 10 Athletic Conference foe Wynford 74-37. The Blue Devils (3-4, 2-2 N10) led just 12-8 at the first stop, but outscored Wynford 41-15 over the next two periods to take control. The deep shot helped, with Carey going 8 for 17 behind the arc. Casey Crawford sparked Carey back there, netting all 12 of his points behind the 3-point line. Hayden Stone and Griffin Summit each tossed in 16 points, with Stone also grabbing 12 rebounds. Josh Crall scored 15 points for the Royals (1-6, 1-4). WOOSTER — Orrville pressured Old Fort into 24 turnovers, and pulled away in the fourth quarter Saturday to claim a 72-64 win at the College of Wooster WQKT Classic. The game was close most of the way, with Orrville holding a 36-34 halftime lead before ending the third period up 50-49. But the Red Riders outscored Old Fort 22-15 in the final eight minutes to seal the victory. Ben Summers paced Orrville with 16 points, Marquael Parks and Logan Domer each netted 15 and D’Vontez Brown had 11. Parks also tallied seven rebounds, five steals and four assists, Domer snared five steals and Cayden McDaniel chipped in eight points and three assists. A.J. Steyer keyed the Stockaders (4-2) with 17 points, 10 rebounds and three assists. Gregory Steyer scored 13 points, Garrett Havens had nine points and Weston Miller dished three assists. ATTICA — Colonel Crawford got off to the better start, but Seneca East came alive with a 16-3 third quarter. However, the Eagles were able to fend off the Tigers in the end with a 44-41 Northern 10 Athletic Conference victory. Gavin Feichtner and Jordan Fenner both scored 13 points to lead Colonel Crawford (4-3, 2-2). Jake Siesel led everyone with 18 points for the Tigers (2-2, 2-2). Tyler Turek had 15 points. BUCYRUS — Mohawk’s 28-point first quarter propelled the Warriors to a 73-43 rout of Bucyrus Saturday in Northern 10 Athletic Conference action. Mohawk (6-0, 4-0) led 28-14 after the first stop and then led 46-25 at the half. 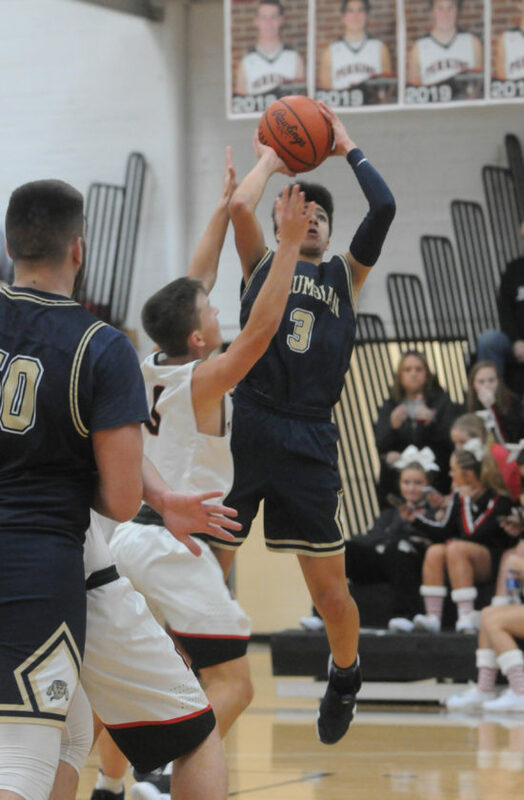 Zach Hayman led nine Mohawk scorers with 18 points, while Keith Jenkins tacked on 12 and Kaiden Hammer, Austin Tusing and Chris Klopp all had 11. Klopp pulled down seven rebounds. Harley Robinson-Koge led the Redmen (1-6, 1-3) with 15 points. Kyle Hamm and Zane Seybert both chipped in eight. The Warriors had the advantage at the free throw line, going 7 of 11, while Bucyrus was 0 of 2. CLYDE — Despite 36 combined points from Cam Farrar and Derick Harrah, Clyde fell to Sandusky Bay Conference Lake Division rival Sandusky, 63-62. Sandusky (4-1, 3-0) led 15-10 after the first quarter and led 25-19 at the half. Clyde (4-3, 2-1) battled back with a 25-point fourth quarter to lead 44-40 heading to the fourth, but couldn’t hold off the Blue Streaks in the fourth. Harrah had 21 points, while Farrar added 16 and Will Dowling finished with 12. For Sandusky, Tahj Staveskie had 18 points, while Dylon Jones added 17 points and Jayden Greene ended with 12 points. SANDUSKY — Sandusky St. Mary led for most of the game Saturday, but Hopewell-Loudon tied the game at 44 to get to overtime. But the Panthers outscored the Chieftains 12-2 in OT to get a 57-46 non-league win. Jordan Jude led St. Mary (6-0) with 17 points, while Myles Bruno added 15 points and Aiden Fullam finished with 13 points. Nate Roesch had 10 rebounds. Jordyn Jury dropped in 18 points, dished six assists and grabbed four boards for the Chieftains (4-3). They also got 10 points from Kyle Rumschlag, nine points from Caden Hoover and seven points by Travis Milligan. Carter Coffman registered four steals.